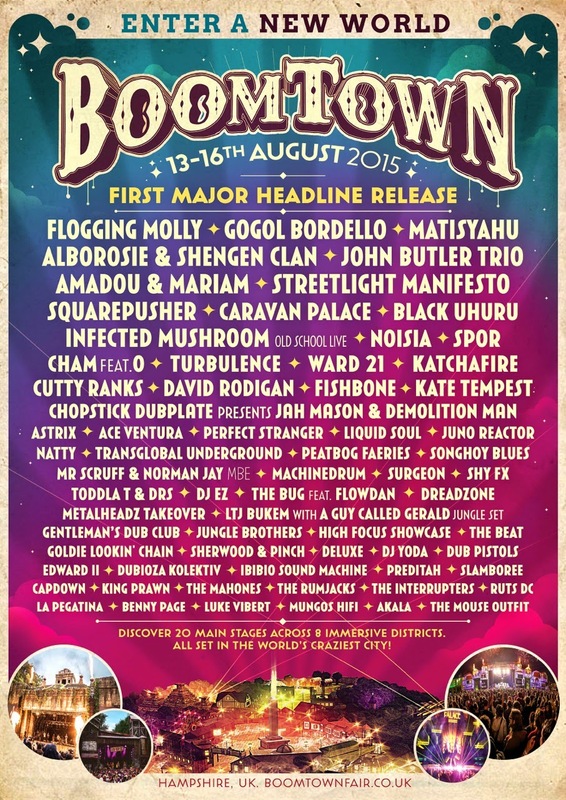 BoomTown Fair has released the first wave of headliners for Chapter Seven of the massively genre expansive festival. 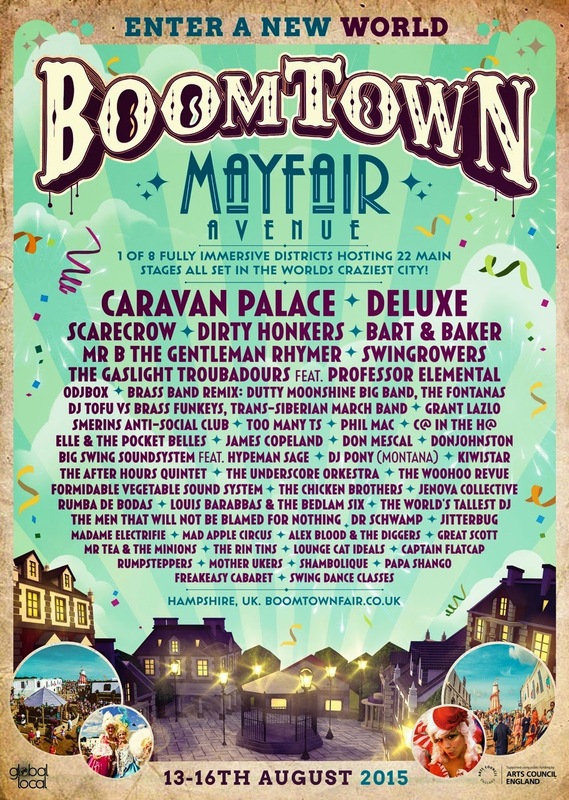 Taking place over 13th – 16th August in the Matterley Estate near Winchester BoomTown once again will house heavyweight names from reggae to ska punk; psy-trance to world music, putting underground genres in the spotlight at one of the most creatively and musically ambitious festivals on the circuit. With 22 Main Stages situated over eight very individual districts the music programming is as diverse as it would be within any large city, providing something for all tastes, ages and cultures! The Town Centre, known for hosting some of the most raucous, party inducing acts this year will host: LA’s anarchic Celtic punk folksters Floggying Molly, bringing their internationally celebrated break-speed anthems to Winchester for a rare and exclusive UK festival performance. The return of the hedonistic gypsy punk of Gogol Bordello, headlining the festival in 2011 they totally blew the Town Centre apart with their rip-roaring, frantic show that whipped the crowd into a palpable frenzy, this year with a new album recently released and the BoomTown citizens more than quadrupled in numbers since the bands last visit to the town, one mega party is expected to kick off! Keeping the knees in the air and the skanking skills up to max is the American ska punk of Streetlight Manifesto. One of the most requested ska acts by BoomTown citizens over the years, Streetlight will be bringing their life affirming vibes and outstanding energy in a very overdue first visit to the fair!! Another returning to the Town Centre are ultra-slick Parisian outfit Caravan Palace. After storming the place with one of the most memorable shows, these premiers of electro-swing and gypsy-funk are guaranteed to host one almighty spectacle, worthy of their fierce reputation as an ultimate live act! Matisyahu, once known for being the Hasidic man of reggae, over the past few years has moved to a more secular style and will be bringing his highly polished reggae tinged hip-hop and soul to the Lion’s Den for a UK festival exclusive. Another festival headliner that can’t seem to stay away from the fair is Alborosie & Shengan Clan, this MOBO award winning artist will be on hand with his thumping basslines and talent that speaks for itself! Joining Matisyahu and Alborosie on the Lion’s Den are reggae legends Black Uhuru, the first ever winners of the Best Reggae album at the 1985 Grammy’s their music has provided a soundtrack to generation with tunes like ‘What is Life’, ‘Shine Eye Girl’ and ‘Guess Who’s Coming to Dinner’ dominating any dancefloor when they drops! Heading over to the southern hemisphere for a taste of New Zealand roots reggae, Katchafire will be bringing their gloriously chilled out sunshine vibes for even more global flavours in the Lion’s Den. Whilst over on the Old Mines folk and world stage are Katchafire’s Antipodean brethren, the awe inspiring John Butler Trio, with guitar skills so incredible the only other sound that can be heard when they are playing is that of jaws dropping to the floor!! These Aussie guitar heroes are a powerhouse of fusing folk, acoustic and roots and are the perfect tonic to a busy festival day! After welcoming the stunning desert sounds of Mali last year with Tinariwen, BoomTown will be making a return voyage to the country for more musical mastery with Amadou and Mariam, fusing Afro pop with desert blues this Grammy nominated husband and wife duo have been performing together for more than 30 years and are the biggest-selling African act of recent times; along with fellow Mali musician’s Songhoy Blues, who were recently pegged as Mail’s next big thing, no small feat considering the company they keep! Other acts on the Old Mines include festival stalwarts Dreadzone with their mashup of dub, reggae, techno, folk and rock, ultimate fusion outfit Transglobal Underground, acclaimed folk roots of Edward II and Scotland’s finest instrumental fusion folk band Peatbog Faeries, full line up for Old Mines will be revealed in a few weeks. The brand new Psychedelic Forest secret headliner has also now been released as Infected Mushroom doing an Old School LIVE set, and joining the already announced Astrix, Ace Ventura, Perfect Stranger, Liquid Soul, Juno Reactor who are topping up a psy-trance bill that is one of the strongest seen at a UK festival in years! DSTRKT 5 dance line up was announced a couple of weeks ago and was headed up by Squarepusher, Spor, Noisia, Machinedrum, Metalheadz takeover, Surgeon and many more. Keep up-to-date with all BoomTown news via facebook and twitter or sign up to the BoomTown Chronicles via the website. "Now in its sixth year, it’s the UKs fastest growing festival. The line-up varied from the obscure to the ridiculous, including pioneering acts across subversive genres with a heavy splattering of reggae… The festival organisers … priority is giving people a good time, perhaps this is the reason for their booming success." "The entire concept is bonkers and the term ‘city’ no exaggeration… Like some dystopian settlement the sprawling site is divided into districts each with its own theme... The music is pop-free and eclectic… If you want to spend a weekend being ceaselessly entertained… check yourself in." "Taking a different approach to other festivals BoomTown creates pop-up city that manages the neat trick of mixing up Burning Man with Latitude offering a sense of immersion and wonder." 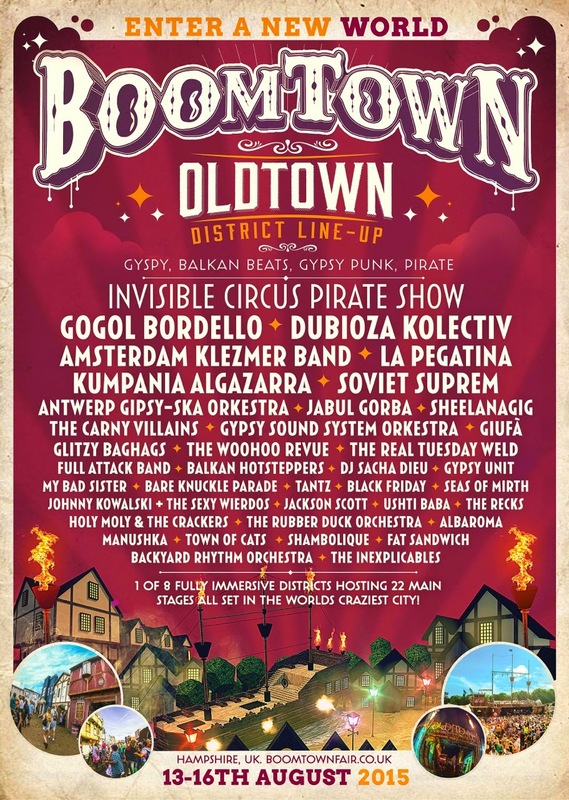 "BoomTown is an astounding and outstanding festival experience... Real life merges with fiction; stories mix with fact. I adored exploring this world of life re-affirming possibility and escaping into impossibility." "Ultimately a distinctly un-categorisable festival… The attention to detail spread across the festival’s entirety is compelling… To re-use the popular saying 'there is something for everyone' would do the festival a huge disservice - something for everyone, and then some."